Orlando Health and Florida Hospital made the announcements on Wednesday. Orlando Health, a health care network that includes Orlando Regional Medical Center, said in a statement to ABC News, "Orlando Health has not sent any hospital or medical bills directly to Pulse patients, and we don’t intend to pursue reimbursement of medical costs from them." Orlando Regional Hospital treated 44 patients of the June 12 terrorist attack, during which gunman Omar Mateen slaughtered 49 people at Pulse, one of Orlando's most popular LGBT venues. Orlando Health said it is "exploring numerous options to help the victims of the Pulse nightclub tragedy address immediate and ongoing medical costs. These include state and federal funds, private insurance, victim funds like the One Orlando fund, disability insurance, Florida’s crime victim compensation program, funding sources established for individual victims, means-tested programs like Medicaid, as well as charity care provided by Orlando Health." The not-for-profit health care network said total unreimbursed costs "could exceed $5 million." 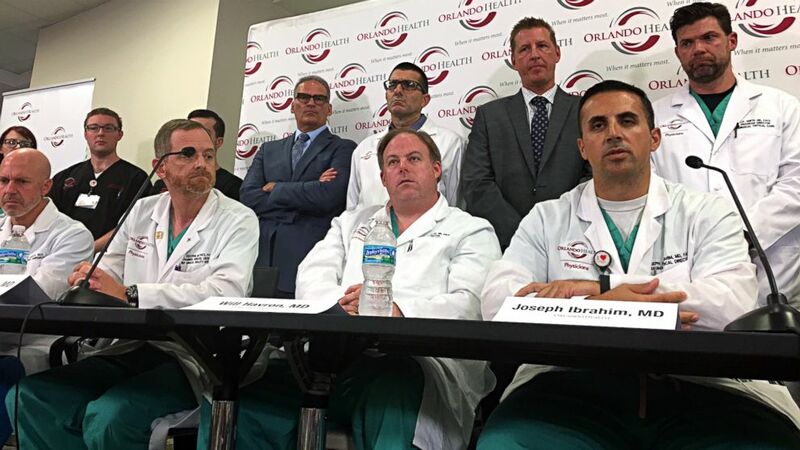 (Naseem Miller/AP) Doctors and medical staff that treated the victims of the Pulse nightclub shooting answer questions at a news conference at the Orlando Regional Medical Center, June 14, 2016, in Orlando, Florida. Florida Hospital, part of the Florida Hospital Healthcare system, treated 12 survivors of the attack. It also said it will not be billing for services, according to ABC Orlando affiliate WFTV. "It was incredible to see how our community came together in the wake of the senseless Pulse shooting," the hospital’s CEO, Daryl Tol, said in a statement. "We hope this gesture can add to the heart and goodwill that defines Orlando." Pulse massacre survivor Mario Lopez, 34, who was grazed by a bullet and had bullet fragments in his left side, told The Orlando Sentinel he welcomes the announcement, since he is uninsured. "I was so worried because I can't afford any of that," he told the newspaper, which reported that his seven-hour hospital visit left him with a potential $20,000 bill. "It's a huge relief."